From changing consumer behaviour—dietary preferences and awareness of animal welfare standards—to increasing extreme weather events as a result of climate change, being a livestock farmer has never been so difficult. We consider some of these challenges and the options to help address them. As we prepare to leave the EU, the focus on animal welfare has never been higher. This is even more critical for the Organic sector, who trade on their higher health and welfare standards. We examine the key areas for dairy cattle health, sharing findings from new research projects and field labs that will assist all dairy farmers in the future. Gram negative bacteria are more resistant to antibiotics than are Gram positive and on-farm culturing of milk samples can reduce the use of antibiotics for mastitis by 25 % without compromising animal health. Mastitis is painful for dairy cows and pain management should be an integral part of treating the disease. Culturing milk causes a day’s delay in treatment and the consequences of this need investigating. However, by using technology as an aid (and specifically a recorded spike in a cow’s core temperature the day before there is any evidence of mastitis in the milk), the cow can be treated for pain and the milk can be cultured so that any delay in treatment is reduced. The use of technology as a tool to promote on-farm animal health and welfare is gaining ground but further improvements requires appropriate financial support for farmers willing to invest as well as communication between different software systems. It also requires support for these early-adopter farmers to promote their experience and knowledge to the wider farming community along with a comprehensive knowledge database that is easy-read and easy-access. Positive animal welfare or, ‘a life worth living’, includes “opportunities provided for an animal’s comfort, pleasure, interest and confidence” (FAWC, 2009). A Resource Tier Framework designed to assess the availability of resources valued by animals showed that many farmers offer higher welfare than that required by law or codes. Despite considerable cost, these farmers receive no financial support and since, for the first time, animal welfare has been named as a clear public good, this ethical value should also be made a market value. Current potential policy opportunities include an Animal Welfare Stewardship Scheme, rewarding higher welfare as well as developing a national strategy claiming higher welfare as in Ireland and New Zealand. Grants are too specific, too bureaucratic and limiting and do not include sufficient support of new technology. Advisory Network needs joining up. Current information and support are fragmented and would benefit from a central knowledge database/comprehensive roadmap. Farm syndicates and Field Labs can help support early adopters. To encourage wider farmer engagement with up-to-date welfare approaches, associated parties such as milk buyers and tech companies could develop user groups. Technology has an important part to play in improving animal health and welfare but software from different companies does not communicate so that much useful data is not readily available or is lost. Improve accreditation. Accreditation should only be given to veterinarians who are good at providing advice on animal welfare. Provide financial support for provision of Public Goods including a welfare approach. Grants should support early adopters and knowledge transfer to other farmers should be a requirement. Grants should be less bureaucratic and limiting to allow for innovative practices to be developed. Changing climates will have adverse effects on forage availability throughout the year. However, there are already a variety of solutions within the industry to help livestock farmers cope with this deficit. Among these, combining grass leys and legume crops into arable rotations is a useful tool for providing additional grazing areas when forage is scarce during climate extremes. These systems also have beneficial effects on soil fertility by reducing the proportion of bare ground over winter, while providing the system with additional organic matter from the plants and animal manure. Silvo-pastoral agroforestry is another useful mechanism for providing additional forage, in the form of browsing. Developing pastures that incorporate trees is not only beneficial by increasing food availability but also through provision of shade and shelter. This not only benefits the livestock but also the plants underneath. Within all systems diversity is an essential element for effectively coping with changing climates. Higher levels of diversity not only provide resilience during periods of stress but also deliver a variety of natural health benefits to the livestock. In particularly, selecting species in relation to the local conditions is a useful way of delivering these beneficial effects and for ensuring forage is available throughout the year. Producing and sourcing quality organic protein for pigs and poultry is a long-standing problem. This session discussed improving the quality of available grain, alternative feed sources and alternative treatments of feed. Sourcing good-quality organic protein is a challenge for the pig and poultry industries and the UK sources much from abroad, including soya from China and India, alfalfa concentrates from France and wheat from the Black Sea area. The UK is currently only 25% self-sufficient in wheat with very few cereals grown specifically for animal feed. Additionally, the protein content in wheat is variable making it harder for feed companies to plan rations. At 13-14%, heritage wheat varieties have higher protein levels than modern varieties but yield levels can be an issue. For feed companies, the variable quality of UK protein sources makes it difficult for them to provide a year-round product of reliable quality. Too little protein and layers stop producing eggs. Additionally, finding an organic material with sufficient methionine, at a national level, is a challenge and an imbalance in amino acids risks elevated levels of feather pecking and cannibalism. Although methionine produced from petrochemicals would not be acceptable, it can also be produced from fermented sugar. Allowing the use of artificial amino acids would remove problems with balancing feed, sourcing more protein, welfare-related issues, as well as being cheaper for farmers. Reducing poultry farming to small scale production would allow the birds to find more of their own food naturally but supermarkets need a constant supply to give the wider public access to organic food. 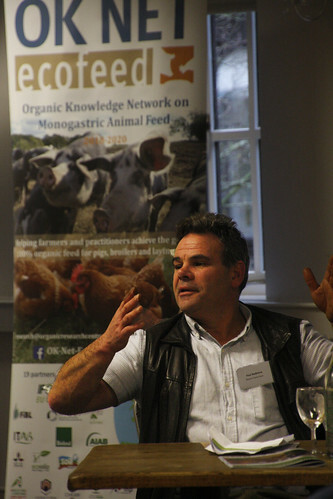 Selecting breeds more appropriate to organic systems would help but slaughter houses are reluctant to adapt to e.g., different size carcasses or small batch slaughter and there is no market for dual-purpose birds since customer expectations include size of cuts. Pig and poultry farmers are heavily reliant on arable growers to support them and for that, a mindset change is needed. Public education is required to increase awareness of what is organic and that e.g., differences in colour of egg shell and yolk have no effect on health of product. Selecting appropriate breeds, that utilise feed better, is difficult. Organic has to follow conventional trends. The 5% derogation could be dropped if methionine was not a limiting factor. Finding an organic material with enough methionine is the challenge.